Publishers: Emanuel Julius, Born: July 30, 1889, Philadelphia, Pennsylvania. Married: Anna Marcet Haldeman, June 1, 1916, Girard, Kansas. Died: July 31, 1951. Marcet Haldeman, Born: June 18, 1887, Girard, Kansas. Died: February 13, 1941. 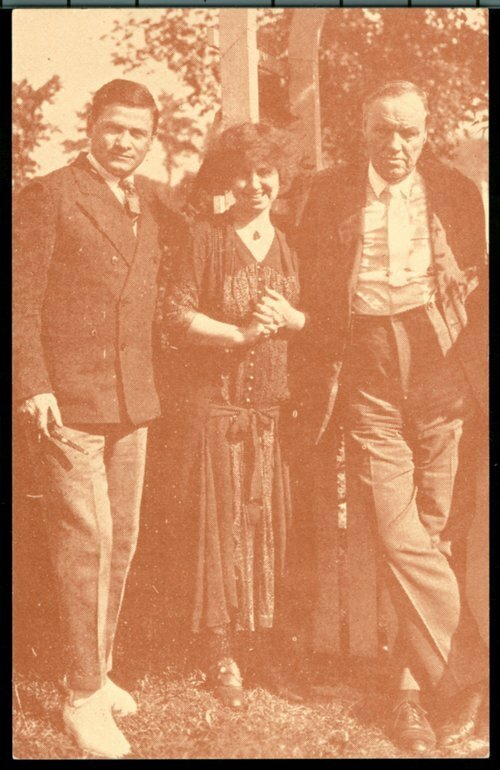 Marcet and Emanuel Haldeman-Julius were called "the Henry Fords of publishing" and the parents of the paperback book. Emanuel Julius was born in Philadelphia in 1889, the son of Jewish emigrants who fled Russia to escape religious persecution. As a boy, Emanuel, too, was harassed for being Jewish, resulting in a disdain for all religion as an adult. After leaving school at the age of 15, he worked at a variety of menial jobs. All the while, he read voraciously. Because literature and pamphlets produced by the socialists were inexpensive, Julius read them and became convinced of their truth. Ultimately he found jobs as a correspondent for socialist newspapers in several cities. In 1915 he was invited to move to Girard and write for Appeal to Reason, then the largest socialist periodical in the country. While in Girard he married Anna Marcet Haldeman, a feminist in her own right. She was the daughter of Henry and Alice Addams Haldeman, one of town's foremost families. Marcet's mother was the sister of the famous reformer Jane Addams. Following their marriage, Marcet and Emanuel decided to combine their surnames, as a demonstration of their commitment to equality, and they became Marcet and Emanuel Haldeman-Julius. The couple purchased a house in Girard on Sinnett Avenue. In 1919 they purchased Appeal to Reason and its printing plant. The Haldeman-Juliuses wrote and published their own work, including the novel Dust, published in 1921. They also began publishing what became known as the Little Blue Books: 3.5 by 5 inch reprints of classical, educational, biographical, and other literature with heavy-paper covers. Originally the books were 25 cents each, but with mass advertising and greater volume, the price was reduced to a dime, later to a nickel. "From 1919 until 1951," wrote historian Mark Scott, "the Haldeman-Julius Press of Girard, printed more than 500,000,000 of the famous Little Blue Books in over 6,000 different titles." Haldeman-Julius devoted his life to crusading against "bigotry and bunk, prejudices and fanaticism." He believed that the life of the average American was harmed by political, economic, and religious restriction designed to promote inequality. One of his purposes for publishing the Little Blue Books was to inform people about things those in power did not want them to know--self-improvement, birth control, the hypocrisy of religion, and similar topics. Critics charged that Haldeman-Julius deceived the public by changing titles of many classics so they would appear to be more lurid than they actually were. He also was constantly in danger of violating federal laws banning the mailing of birth-control information. But to millions his publishing company in Crawford County made books available that would otherwise be unaffordable. In 1933 the couple legally was separated but continued to live in the same house. Marcet died in 1941, and Emanuel remarried a year later. He drowned accidentally in 1951 at the age of 62. At the time of his death, his firm had published more than 500 million books.